The University of Ulster this week hosted a visit to the Magee campus by the Rt Hon Owen Paterson, Secretary of State for Northern Ireland. He was welcomed to the campus by the Vice-Chancellor, Professor Richard Barnett and Professor Deirdre Heenan, Provost of Magee. 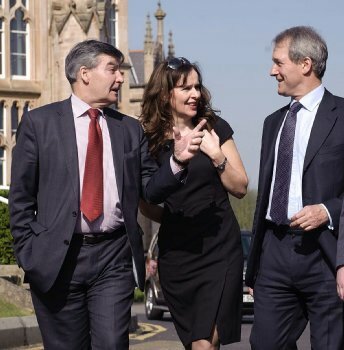 It was Mr Paterson's first visit to the campus since becoming Secretary of State. The Secretary of State toured the campus, and met students and staff from the Intelligent Systems Research Centre, from INCORE, and from the School of Creative Arts. During his visit, the Secretary of State was briefed on developments at both the University as a whole and the Magee campus in particular. At the Foyle Arts Building, the Secretary of State heard a performance by the University’s choir, while later, at the Intelligent Systems Research Centre, he was briefed on the latest advances in artificial intelligence and robotics from Ulster scientists. While on campus, he also met Professor Brandon Hamber, Director of INCORE, and Foyle MP Mark Durkan.